This week­end I’m going through pho­tos that I’ve tak­en in the last year or so as I pre­pare for this year’s Gold­bar sale (see pre­vi­ous post for details). It’s great look­ing back at these pho­tos, remem­ber­ing the times I was out to cap­ture them, and real­iz­ing that it’s been far too long since I’ve updat­ed my web­site to share some of these with you. So, per­haps for the next few posts I’ll show you some of the images I have par­tic­u­lar­ly enjoyed re-dis­cov­er­ing as a teas­er for the web­site updates I’m cur­rent­ly work­ing on (shouldn’t be too long now…). 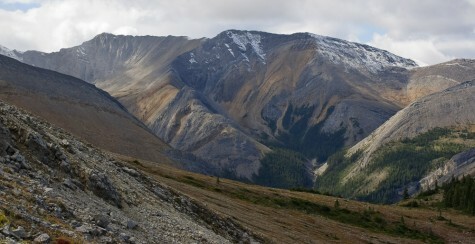 I took this pho­to­graph while hik­ing the Sul­phur Sky­line trail in Jasper Nation­al Park. It’s a short­er hike, with pret­ty steep (and con­stant) ele­va­tion gain, and the view from the top is incred­i­ble. This one is from the way back down (eas­i­er to think about mak­ing pho­tographs once the pulse has slowed down a lit­tle), look­ing south­east I believe – which would make this either Utopia Moun­tain or Mount O’Hagan. Does any­body know for sure? Besides the view, the best thing about this hike is that the trail­head is a few hun­dred meters from the Miette hot­springs – def­i­nite­ly a great way to end a day of climb­ing, I would cer­tain­ly rec­om­mend it next time you’re in Jasper.